Today, in a headline that came as somewhat of a shock (that, of course, I first saw on twitter) Kory Teneycke, the Quebecor Media vice-president and main advocate for the proposed Sun TV News Channel, announced his resignation. As backgrounder for those not familiar with this story, the proposed Sun TV News Channel is seeking to bring a conservative, Fox styled cable news channel to Canada. There has been a little bit of a battle over what type of license they should get which is covered very well in this blog post. What’s important is that Avaaz launched a petition against the proposed channel which subsequently had a number of false names added to it (adding someone else’s name to a petition is, I’m told, illegal in Canada). On September 2, 2010, Avaaz became aware that an individual operating from an Ottawa IP address was adding both fictional and actual names and email addresses to a petition to stop Prime Minister Harper from pushing biased crony media onto Canadian airwaves. 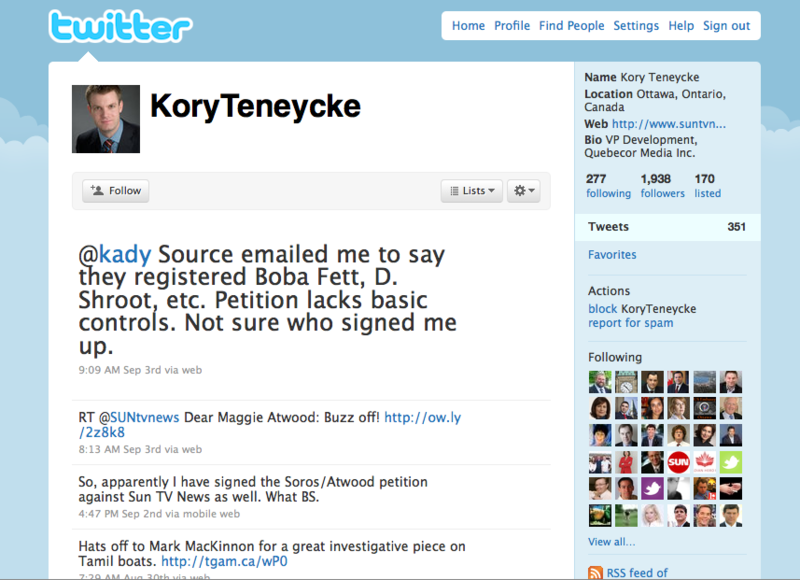 The next morning, Quebecor executive and Sun TV front man Kory Teneycke published several pieces in Quebecor owned newspapers attacking Avaaz and accusing them of running a fraudulent petition – even quoting actual names added by the fraudster. Teneycke later admitted to insider knowledge of both the perpetrator and crimes committed. Days later, Quebecor threatened to sue Avaaz for the content of its petition site. In short, it appears that either Teneycke or someone he knew was adding false names to the petition so that a) Teneycke could write a story to discredit the petition and b) prompt Quebeccor to launch a lawsuit to have it taken down. This is serious stuff. Especially from someone who intends to run a news channel. (although, to be fair, it is consistent with the type of thing one might expect from Fox News). Perhaps Teneycke’s resignation has nothing to do with the false names on the petition? But it is also worth noting that Teneycke’s twitter account is no longer active. This also means that the original offending tweet where he admits that he knew the person adding the false names can no longer be seen. Fortunately, on a lark, I took a screen shot of it the day it went up since, after reading CBC reporter Kady O’malley’s excellent coverage of the back and forth, since given her coverage something seemed very odd about the whole affair. So what are some key lesson here? c) It appears that Sun TV executives are every bit as slimy as the counterparts feared they would be. If even 10% of this is true then this is shocking behaviour from a proposed News television executive. This entry was posted in canadian politics, commentary, media and tagged canadian politics, CBC, media, politics, twitter on September 15, 2010 by David Eaves. Putting the con in neo-con. Thanks for the news, been following that story closely. Hugely proud of Avaaz for choosing to stand up and fight, something I think a lot of orgs would have shied away from.